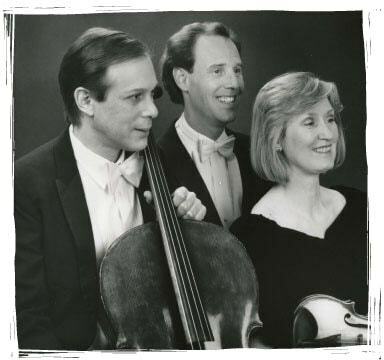 Acclaimed as "distinguished by technical polish and keen musical understanding" in The New York Times, "first rate," in The Washington Post, "spectacular" in the American Record Guide, The American Chamber Trio has appeared nationally and internationally for over two decades. They have toured to South America and the Far East under the auspices of the United States State Department and the Chinese Ministry of Culture, with performances in Hong Kong, Shanghai, Beijing, Singapore, Bogotá, and São Paulo. In New York they have played at Alice Tully Hall, have given four series of concerts at Carnegie Recital Hall and have presented retrospectives of music by Brahms, Beethoven, Ravel, Ives and Bartók. They gave the first New York performance of Rebecca Clarke's now well-known trio under her supervision over 50 years after its composition. They performed at the Ives Centennial and the American Music Week at the National Gallery of Art in Washington, D.C., and played major concerts in Los Angeles, Pittsburgh, Chicago, Denver, Honolulu, Columbus, and Atlanta. Their recordings include the complete trios of Brahms, the "Archduke" Trio of Beethoven; the Ravel Trio and the Tchaikovsky Trio; William Ryden's Rags, Spells, and Tangos; and a video of the Shostakovich and Brahms B Major Trios. Publications include Brahms Trio in B Major, Op. 8, revised; Trio in C Major, Op. 87; and Trio in C Minor, Op. 101; published by International Music Company (IMC); and the Wonderland Rags of William Ryden, published by Masters Music. Copyright 2019 American Chamber Trio. All Rights Reserved.